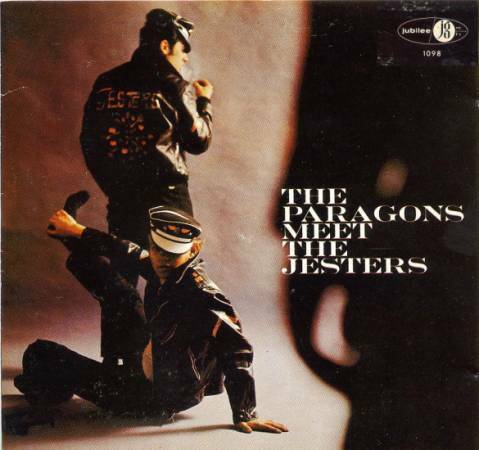 It's hard to imagine a more quintessential New York sound than the Paragons and the Jesters. Yell at me all you want, but to this day, I still can't tell them apart. More than that, I can't remember hearing a single tune by either of them until the Paragons Meet The Jesters album was released in mid-1959. And yet, when I heard the album, it all sounded so right. This was the way New York music was supposed to sound. The Jesters had their start at Cooper Junior High School (on 120 Street in Harlem) in early 1955. 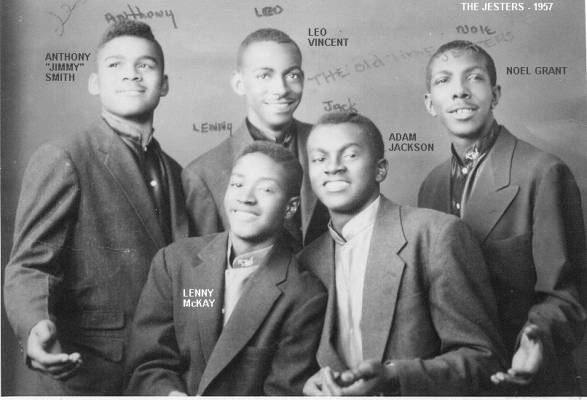 Originally a quartet, the members were: Lenny McKay (lead), Anthony "Jimmy" Smith (second tenor), Leo Vincent (baritone), and Noel Grant (bass). They named themselves after Noel's favorite movie: Danny Kaye's "The Court Jester." Most of their influences were neighborhood groups: the Cadillacs, the 5 Willows, and the Valentines. They also loved the Moonglows and the Drifters. As was the case with most groups, they began appearing at local talent shows and dances. In late 1956, they decided that they needed a fifth member to sweeten their sound. Therefore, when they heard Adam Jackson singing on a 122 Street corner, they snapped him up and started practicing in earnest. Another group from the neighborhood was the Schoolboys, which contained Lenny McKay's brother, James, and Roger Hayes. Roger's sister, Ann, became the Jesters' manager. The top-of-the-heap talent show in New York was the Wednesday night Apollo Theater Amateur Show. In the spring of 1957, the Jesters won the contest three weeks in a row. 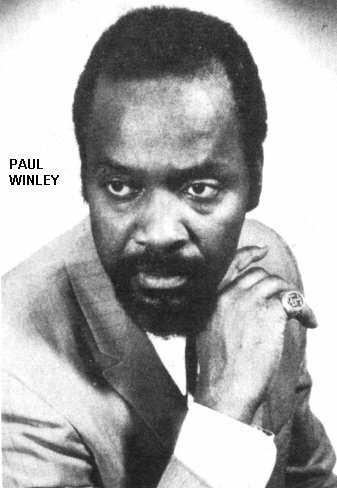 After their third win, they were approached by Paul Winley, owner of Winley Records (which was distributed by and advertised by Jubilee Records). Winley, brother of Clovers' bass Harold Winley, offered them a contract. It wasn't just that Winley was impressed with the Jesters' sound; he realized that they sounded a lot like the Paragons, who were already recording for him, and he recognized a gimmick when he heard one. It was about time, as far as they were concerned. They'd already made recording arrangements with Old Town, but couldn't force themselves to sign the contract. There was also an audition for Columbia, but the company wasn't interested. 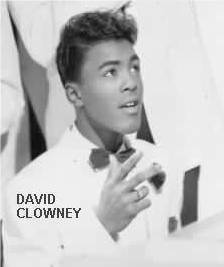 Winley hooked them up with Dave Cortez Clowney, a first tenor who had been an original member of the Pearls (and who would become "Dave 'Baby' Cortez" in the future). At the time, Clowney was singing with the Valentines, but free-lancing as an arranger. 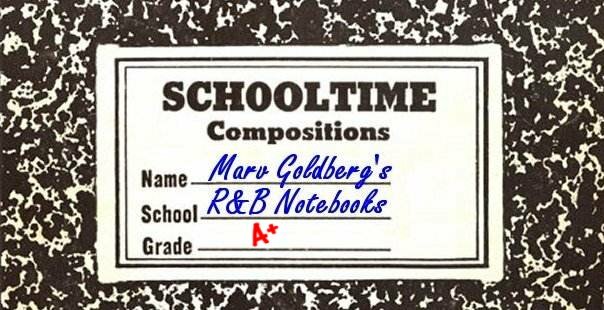 He did the arranging for most of their early tunes, occasionally getting writer credit as well. Their first release was "So Strange"/"Love No One But You" in May 1957. On both of these, you'll hear Clowney's piano accompaniment as well as leads by Lenny McKay and high tenor second leads by Adam Jackson.Strangely, over a five-year period, Winley only sent a single Jesters record ("The Wind") out for review. The authorship of "So Strange" is pretty strange in itself. Adam told me he wrote the tune one night on a subway. By the time it got to record, David Clowney's and Paul Winley's names were also included as authors. The one guy they left out was that up-and-coming R&B tunesmith Cole Porter. In truth, the lyrics had been "adapted" from Porter's "So In Love," written in 1948 for Kiss Me Kate. By the look on Adam's face when I mentioned this, I'm sure the whole thing was subconscious. However, it is of such stuff that lawsuits are made. I hope he was thankful it wasn't a hit! On June 28, 1957, the Jesters were part of a Dr. Jive stage show at the Apollo theater. Other acts on the bill were: the Sensations, Charlie & Ray, the Charts, the Velours, Roy Brown, the Heartbeats, Ann Cole, the Charts, Joan & Joy, and Donnie Elbert. When "So Strange" failed to take the world by storm, Winley issued "Please Let Me Love You"/"I'm Falling In Love" in October 1957. The former tune was led, once again by Lenny McKay, with assist by Adam Jackson. The flip, a rip-roaring cha-cha, was fronted by Adam. 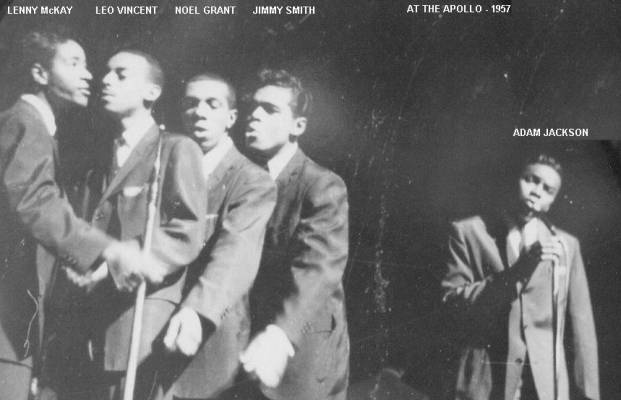 On November 29, 1957, it was back to the Apollo Theater for another week with a Dr. Jive show. This time, they shared the stage with: Ray Charles, Mickey & Sylvia, the Velours, the Kodoks, Bobby Day, Screamin' Jay Hawkins, and JoAnn Campbell. On April 18, 1958, the Jesters joined the "Gala Rock 'n Roll Revue" at Cooper Community Center in Manhattan. The MC was Herman Amis of WOV, and the acts included Billy Valentine, the Willows, the Inspirations, the Versatones, the Unique Teens, the Personalities, the Sportones, Chuck's All Stars, and the Lane Dancers. The final platter by the original group was issued in June 1958: "I Laughed"/"Now That You're Gone." Both were led by Lenny, with assist from Adam on "Gone." These were released on Cyclone, a subsidiary of Winley, nominally owned by Paul Winley's wife. "I Laughed" was somewhat based on the Spaniels' 1957 tune, "Everyone's Laughing." 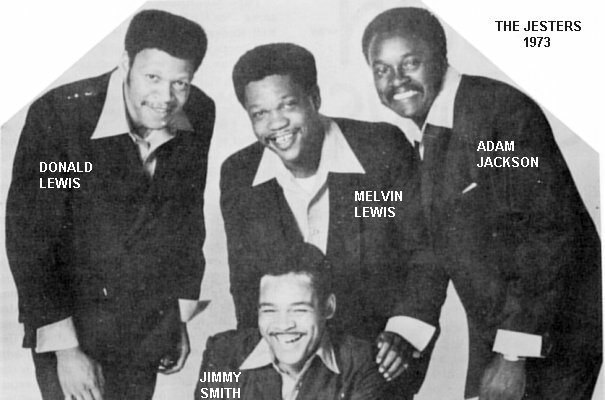 There was one other record that featured the original group, this time as a backup to Charlie White, former member of the Dominoes, Checkers, and Clovers. The tunes ("Nobody's Fault But Mine"/"Dearest To Me") were issued sometime in 1958. And then the Jesters began to fall apart. Noel Grant wandered off one day and never returned. Then Leo Vincent was drafted. Lenny McKay jumped ship to join another group. This just left Adam Jackson and Jimmy Smith, who weren't ready to throw in the towel just yet. They "stole" baritone Charles "Melvin" Lewis away from a local group called the Canaries (he'd previously been with the Climbers). Lewis, in turn, brought in his brother, Donald, as bass. Considering how meager their earnings were, they decided to keep the group a quartet in order to each get a larger split of any money they might see. In mid-1959, Jay-Gee Records (part of Jerry Blaine's Jubilee empire) released an LP called The Paragons Meet The Jesters. It was part of a 5-LP matched set (which included Whoppers, Boppin', The Cadillacs Meet The Orioles, and Rumble). From the "concept" covers (motorcycle gang "hoodlums") to the content from the vaults of Jubilee, Josie, Whirlin' Disc (which Jerry Blaine owned along with Bobby Robinson), and Winley, these albums were winners in every way. But times (and sounds) were a-changing. In 1960, the new Jesters went back to Paul Winley (under the theory that the devil you know is better than the one you don't). The only real reason that they considered recording at this time was to keep themselves fresh and get bookings. It certainly wasn't for the money. In May 1960, Winley released "The Wind"/"Sally Green" by the Jesters (both featuring Adam Jackson). "The Wind" is a wonderful re-make of the Diablos tunes. However, the original was such a special song that any re-make would, by necessity, pale by comparison. Anyway, I always liked the flip better. Actually, I wasn't alone. 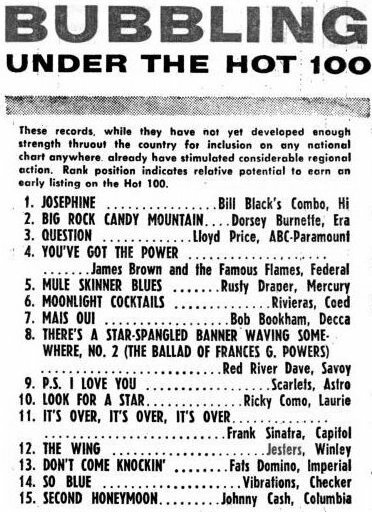 This is the only Jesters record that Winley ever sent out for review; the trades liked "Sally Green" better than "The Wind" (which was spelled "The Wing" when it was listed in the "Bubbling Under The Hot 100" column on June 20). A few months later, Winley issued "That's How It Goes"/"Tutti Frutti." On the former, Adam is drifting toward a soul sound. "Tutti Frutti" is, of course, the Little Richard masterpiece, updated and "enhanced" (that's sarcasm, in case there's any question in your mind) by violins. 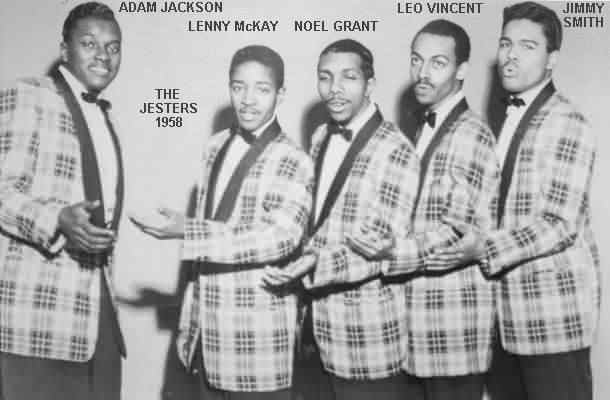 On July 1, 1960 the Jesters made their last appearance at the Apollo. This time, they were part of a Jocko show, along with Ruth Brown, Bobby Freeman, Ben E. King, the Olympics, and Dante & Evergreens. On stage, they got to back up Ben E. King when he sang some of his Drifters hits. During this period, they also backed up Ann Fleming (a Winley recording artist, who just happened to be Paul Winley's wife), but I don't know on what tunes. Their final Winley record was "Uncle Henry's Basement"/"Come Let Me Show You," released in 1961. The novelty "Basement" was led by Adam (and had saxman King Curtis); Jimmy Smith fronted "Show." After this, they decided not to record any more and Jesters records on Shimmy and Mojo are by different groups. The Jesters remained together, on and off (but certainly not full time) throughout the 60s and 70s. In 1974, they added tenor Ronald Jackson (Adam's brother) to become a quintet again. Ronald Jackson had been one of the leads of the Youngtones on X-Tra. At the time the interviews were done in 1975, the Jesters were considering plans to make a comeback. However, while the Jesters remained together for oldies shows, there were no further recordings until they did a couple of sides for Starlight in 1986. 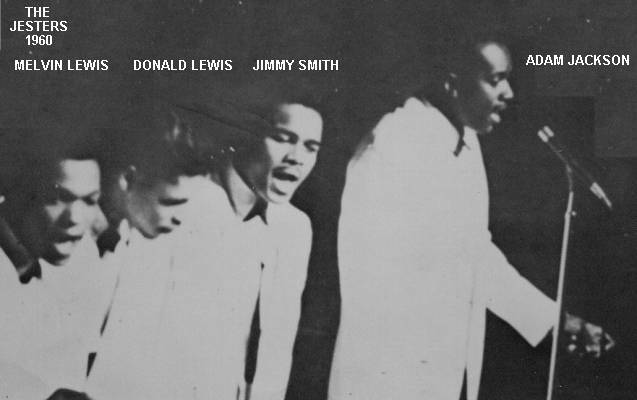 By then, Jimmy Smith had given it up, to be replaced by second tenor Marshal Cherry. Sadly, Adam Jackson passed away in February 1994. Melvin Lewis died in May 2010; his brother, Donald predeceased him in the late 90s. I wish I could say that the Jesters were a big part of my formative years, but, again, I don't remember hearing a single song by them when it was current (I'm sure I did, I simply don't remember). However, when The Paragons Meet The Jesters hit the streets, the Jesters had a fan for life. Special thanks to Bob Kretzschmar. Discography by Ferdie Gonzalez.